Discussion in 'Traditional Folders and Fixed Blades' started by Jack Black, Aug 2, 2013. I had a very nice surprise the other day when ScruffUK kindly presented me with a British Army WW2 pattern clasp knife made by Taylor&#8217;s Eye Witness of Sheffield. I&#8217;ve not seen a clasp knife made by Taylor&#8217;s before, so it&#8217;s been great to have a look at one. In my opinion, they were one of Sheffield&#8217;s better cutlery firms, in terms of the quality of their product. 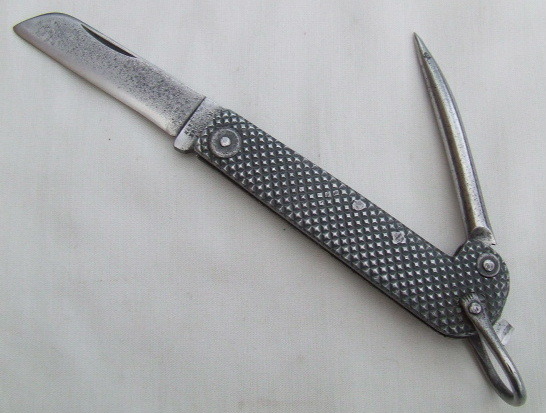 This is one of the earlier post-1939 patterns, from before the addition of a bottle-opener to the can-opener blade, but with a steel rather than copper bail. The earlier bolsters have gone, but the screwdriver is there. Interestingly, the chequered covers have been smoothed over on one side. My guess is that whoever did this, probably some bored British &#8216;Tommy&#8217; wiling away long war-time nights, intended to do the same to the other side, but Rommel, the NAAFI (see http://en.wikipedia.org/wiki/Navy,_Army_and_Air_Force_Institutes but read &#8216;Bar&#8217;! ), or a roasting from his Sargent interrupted things. That's a pattern that always intrigued me, but they are not that common this side of the big pond. Plus, the one time I got to handle one, it was memorable for the week in the hospital to fix the hernia I got trying to open it. This is a great idea for a thread Jack. Are just regular pics of these blades in use welcome as well? 'Cause from time to time I guess I'll be making some of those for sure . There's some new reading material as well, with all the links combined in one post. Good stuff! Sorry, Jack, could you tell me again how the navy clasp knife differed from the army's? Was it absence of the can opener? I might try again, but I'd have my son in law, John C. also known as Olaf The Terrible, carry it and open it for me when I need it. He's the large fellow on the left. Great idea Jack. These fascinate me ... not quite the Camillus folder with spike I carried in the Navy. I've got to get myself one when the opportunity presents itself. I never expected to find a WW2 Australian Commando dagger in a local pawnshop ...the hunt is part the enjoyment for me so I'll eventually find one - when the time is right. Any excuse to go to the pawnshop or flea market is helpful. If I can find the perfect alignment of a quilt shop or craft store with a flea market then I get no resistance from my better half. I suspect that the advent of cargo straps and then Velcro have done away with most of the "planned" uses for a spike on a military folder. I get the impression this knife was issued to all branches of His Majesty's forces. Was a clasp knife issued to each service member? I agree with your assessment that his Petty Officer or Color Sargent put the kibosh on smoothing out the other side. "If it was meant to be smooth it would have been issued smooth!" I might have said something along those lines a time or two myself ... not about a folding knife but the principle always holds true. He looks like he could open an oil drum with not even five fingers. Good man to have on your side I dare say Carl. I remember the pic from when you posted it before. I can see where the nickname came from! the hunt is part the enjoyment for me so I'll eventually find one - when the time is right. Any excuse to go to the pawnshop or flea market is helpful. Nice thread Jack. Will be good to see this develop. Here are some examples from the Belgian army/nacy clasp knives. I own 4 different types, of which one is not pictured. It's an unbranded one from the army (since it's marked ABL). The scales where of such bad quality that they just chipped away. Not only shrinkage, but they just came off. Hence, it's now completely disassembled in a box waiting for reassembly and rescaling. So here are the three other ones. Two of them are probably made by British contractors for the Belgian army (ABL), namely the ones stamped Colin Winand (1951) and Colasse (1950). The other one was made by Friedrichswerk in Germany (for the Belgian Navy, because of the ZM/FN marking). Some things can be noted immediately. The one from Friedrichswerk is overall slightly larger and the lanyard thing is more heavy duty (and larger) than in the other knives. Furthermore, that knife has both nail nicks at the same side, whereas the other two knives have nail nicks on opposite sides (notice that the blade doesn't show a nail nick on this picture). With regards to F&F and durability: both the scales of the Friedrichswerk and Colin Winand knives have held up great. I have two Colin Winands and none show shrinkage, and neither does the one from Friedrichswerk. In contrast, I own two blades from Colasse, and both of them show heavy shrinkage and cracking of the scales... This can be noticed in the picture as well: the plastic scales do not sit flush with the metal liners, plus: huge gaps have developed between scales and liners. Here's the trio with their can openers extended. It's clear that the one from Friedrichswerk is flatter at the top and has an elongated spine at the bottom. The trio with the blades extended. Again, notice the difference in shape between the one from Friedrichswerk and the others. The two british examples are more 'blunted' whereas the one from Friedrichswerk is a bit more acute. It has a swedge as well. In the end, I'm pretty curious to the steel they used and how it differed among contractors. I don't notice a lot of difference in performance anyway. The British examples are very similar in design and overall shape. Maybe both contractors used the exact same blueprint or something, but it's clear that they are similar to each other, whereas they differ to a larger extant from the German one. If someone had the choice in picking one of these up and you want to use them instead of merely collecting them: go for the one made in Friedrichswerk. All of these blades are somewhat difficult to open, but that one is the easiest. It has good F&F and is made of good materials. Avoid the ones made by Colasse or the unbranded ones, again: unless you wish to collect them or rescale them or something. The ones made by Colin Winand are close in quality to the German made knife, but are slightly more difficult to open. The bear trap pulls scare me away from these knives, I hate nail breakers or even nail benders. Interesting pattern none the less. Sorry mate, I was under pressure, didn't even see it until I posted the pics. Very interesting thread, Jack!! I am enjoying reading all about these clasp knives. Once again, great pics Jack. I wanted to ask you something about relative size of these knives. I've only got experience with Belgian made examples. When I was in the Klingenmuseum in Solingen, Germany last week, I noticed that one of the showcases had a large military clasp knife in it (couldn't read anything of the markings, but I suppose it's British). It was remarkably larger than the Belgian ones I have. Are there large size differences between the Belgian ones and the early British ones? Thanks!